Decolourise your colourfast coloured laundry safely and gently. 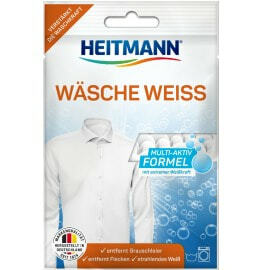 HEITMANN Coloured Fabric Decolouriser reliably dissolves discolouration and greyness without affecting the original colour of your laundry. Protects the original colour of the textile. Coloured Fabric Decolouriser for colourfast coloured laundry and delicates, for use in the washing machine. This decolouriser removes discolouration from colourfast coloured laundry without affecting the original colour of your clothing. In contrast to conventional decolourisers, HEITMANN Coloured Fabric Decolouriser does not affect the colour of your fabrics. With its gentle formula, the decolouriser encapsulates any loose discolouration that has adhered to the fabric, detaches it, and simply washes it away. Even greyness disappears. Important: Coloured Fabric Decolouriser does not work on synthetics such as polyester, polyamide, and microfibres. One package contains enough solution for 3 kg of laundry (dry weight). For best results, use at 60°C. The result can also be improved with repeated use, especially in the case of severe or old discolouration. Efficient, gentle, reliable—the gentle formula of the Coloured Fabric Decolouriser encapsulates discolouration and removes it without affecting the original colour of the clothing. Fill the washing machine with up to 3 kg of coloured laundry. Add the contents of the decolouriser to the detergent compartment. Do not use detergent or fabric softener. Select a 30°C, 40°C, or 60°C programme for coloured laundry, without pre-wash or economy function, and start the machine. Always use the highest temperature allowed according to the care label. Allow the programme to finish.